The rainy season in Japan is really wet and starts when spring turns into summer. In Tokyo, it begins in early June and lasts until the second half of July. This is the time of year when the moss grows lush and green. Mosses are one of the most primitive terrestrial plants but they are deeply rooted in the Japanese way of life. Moss has long been an important element of the art of bonsai and landscape gardens in the Japanese style. Some of them are completely covered with lush green moss. Moss is also the home for small forest creatures. Some insects and spiders use moss as a place to hide and live. This is fundamental to their existence. There are over 20,000 species of mosses in the world. Asides from very dry environments such as deserts, mosses are found everywhere on the ground. Even at the poles and in the Himalayas. There are about 1700 species of mosses in Japan. The humid climate of the island provides good conditions for its growing. Moss-covered landscape is most easily found in Kyoto which is surrounded on three sides by mountains. At their feet are the main temples and sanctuaries. Their forests and gardens are considered sacred and properly protected. Honen-in is a temple in the Higashiyama area. The garden of the temple is full of clean water and lush moss. Crystal water flows from the mountains thanks to which, the Honen-in garden is moist all year round. We found the Honen-in temple by coincidence. We admired sakura trees on the “Path of Philosophers” and our attention was drawn to a plaque with the name of the temple. We decided to turn off the route for a moment to see Honen-in Temple and it was a good choice. There was no one in Honen-in except us because it was pouring with rain. And of course everyone was focused only on sakura trees. The temple is dedicated to the Honen monk who founded the Jodo-shu Buddhist school. In front of the main gate is Byaku-ki-dan, a Zen garden. It is made of white sand which symbolizes water. When you pass by garden you cleanse your body and mind. Every few days a monk draws a new pattern on the sand. However, the most important role in Honen-in is played by the moss. It makes the atmosphere of this place mysterious, like from another world. And now a few curiosities about moss. Moss has leaves and stems but no roots. Instead, it sticks to the surface with rhizoids – primitive roots that cannot absorb nutrients. According to popular opinion, the moss grows only in wet and dark places. However, to get the necessary nutrients mosses depend on the photosynthesis that takes place in their leaves. This means that they need a lot of sun. When the water is sprayed onto dry moss, the leaves open and draw water. Their primitive biology makes them unable to store water. They only need it when they grow. That’s why wet places where there is always water are not good for mosses. They also need water to breed. They have a male and a female organ. When it rains, male organs release a cloud of sperm. The sperm flow through the droplets of water to reach the eggs inside the female organs. A fertilized egg forms a spore capsule from which it is released. During our walk around the temple, Honen-in it was raining. Does this mean that the moss spurted on us with the cloud of its sperm?! The temple gate is opened only twice a year. From April 1 to April 7, when Tsubaki or Japanese camellia blooms and from November 1 to 7, when the maple leaves turn red. We got to Honen-in after April 7 and only last flowers of camellia were found here and there. Flowers and leaves in the moss-covered fountain in Honen-in were carefully arranged by the temple monks. In the former temple store house which is now a lecture hall, concerts and exhibitions are sometimes organized. In the main hall there is a statue of the temple main deity of the Amida-nyorai. It is the Buddha of Unlimited Light, which provides salvation to all who have called his name. Many famous Japanese are buried in Honen-in. Novelist Junichiro Tanizaki, philosopher Schuzo Kuki and painter Heihachiro Fukuda. They were sure that they would find peace here. Temple Honen-in has a climate like from a fairy tale. Everything is covered with a moss which is also an important element in other Japanese gardens. Stone gardens or Zen gardens became popular in Japan in the fourteenth century. They are also called dry gardens. As the name suggests, there is no water in them and the main elements are gravel and larger stones. In this dry environment moss is used as a source of moisture. The Japanese Zen garden reflects the natural landscape and the moss gives the rocks a mountain look. Moss can also be used for interior decoration. It is blended into miniature landscapes that depict scenes from nature. Moss is also used in bonsai – a traditional Japanese garden art. Plants are grown in small containers and their trunks and leaves are arranged in an artistic way. Pine and maple are the basic plants of a bonsai but moss is also a key element. 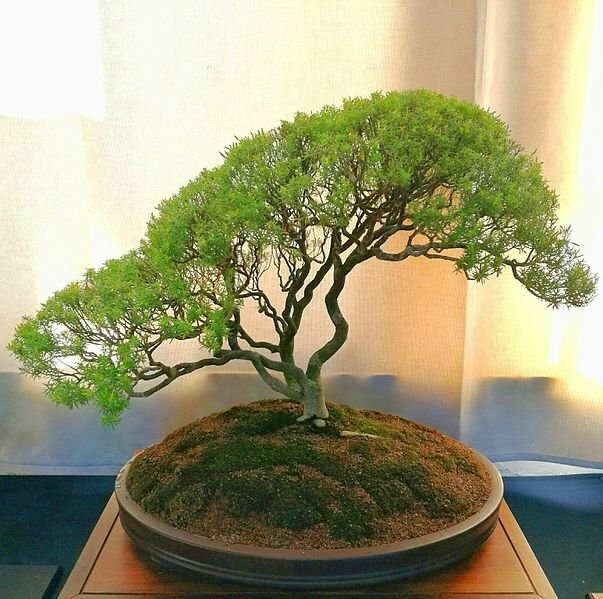 It covers the soil from which bonsai grows which gives it elegance and even a touch of divine. Moss, despite its primitive nature, is an important element in Japan. It is inextricably linked to the climate of this island and thanks to moss the Japanese ecosystem is so rich. Even the national anthem of Japan says about moss. „A thousand years of happy life be thine! Moss makes the gardens of the Honen-in temple mysterious and extraordinary. The temple is closed for most of the year, which is why there are not many tourists here. An that is good. Thanks to this, this gem is still undiscovered.